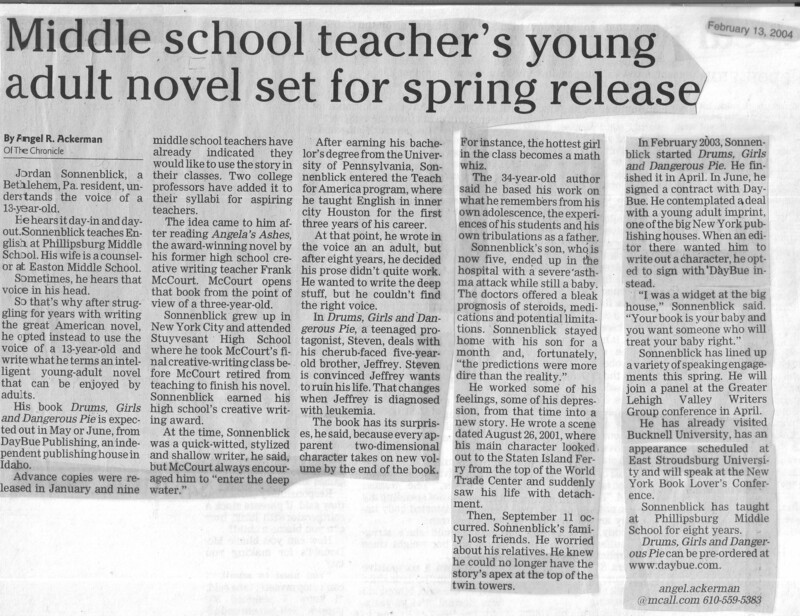 In 2004, author Jordan Sonnenblick was still a middle school English teacher in the Phillipsburg School District. At the time I et him, he was anticipating the release of his first book, Drums, Girls and Dangerous Pie, from a small publisher, Daybue. I can’t believe that we’re approaching the ten year anniversary of that event. I forget how I heard about Jordan. I don’t know if someone sent me a press release or if I heard about his success at a school board meeting. I followed up because as a writer myself, his story intrigued me. We met in a coffee shop across the street from my office. We talked about his past, his struggles as a writer and why he rejected an offer from a big New York publisher to go with a small independent publisher instead. I remember my own awe when he said his creative writing teacher in high school was Frank McCourt. Yes, as in Angela’s Ashes. I also enjoyed his sense of humor. Apparently, success found him when he stopped trying to write the next Great American Novel and instead used the voice of a 13-year-old boy. Shortly after all this, Sonnenblick landed a contract for Drums from Scholastic. The book now has a sequel. I’m not sure how many books he has now. 9? 10? He has one available for pre-order and it could use some hubbub. Jordan is a great guy. I’ve read several of his books and I love them.